This is a scandalous discrepancy when, as mentioned in the article, you consider that there will be nothing worth protecting in a few decades if our addiction to fossil fuels is not curbed. Instead such funding should be diverted to investigating technology like cloud-seeding, solar-power generation, renewable energy grids or even beaming energy from the Moon. All of these options have to be more constructive than designing new and more effective ways of blowing things up. It seems to me that we already have so many effective and proven options for generating enough energy in a clean and sustainable way but the political will and ability to organise ourselves is what is lacking. I’ve written recently about the potential to generate electricity via solar power generation in the deserts of northern Africa that can then be transmitted to and consumed by Europe. 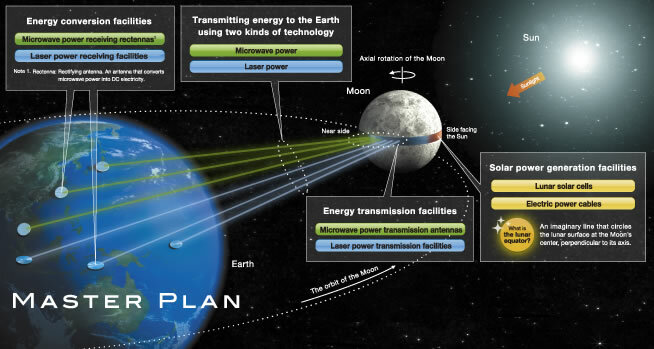 Now there is a new, somewhat less realistic but nonetheless intriguing, proposal by Shimizu Corporation in japan to generate electricity on the Moon and then beam it back to Earth. The Luna Ring. 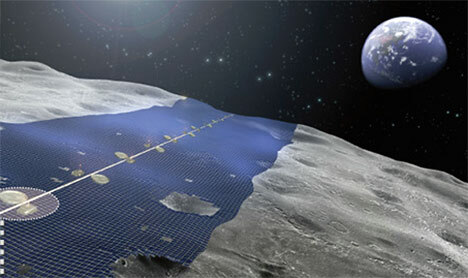 The proposal would be to establish a band of solar cells around the Equator of the Moon, the area which, like on Earth, is exposed to the most sunlight throughout the year. Such a band would need to be 11,000kms long to completely circumnavigate our nearest neighbour and the proposal is for it to be up to 400km wide. The electricity generated would be transmitted to a point on the near side of the Moon (the Moon is in synchronous rotation around Earth, always showing the same face to us) where it could be converted to microwave or laser before being beamed back to Earth. These beams would be aimed at collectors on Earth which would convert it back to electricity and feed it into the grid. Obviously the Moon does not stay above the same part of the Earth at all times so the collectors would need to be distributed around the planet. In addition, a guidance beacon would ensure the laser/microwaves are hitting their intended target otherwise the power would be cut. It is not difficult to imagine scenes of a giant space laser cutting a swathe through New York City (it’s always NYC in the movies) without such a safety device. 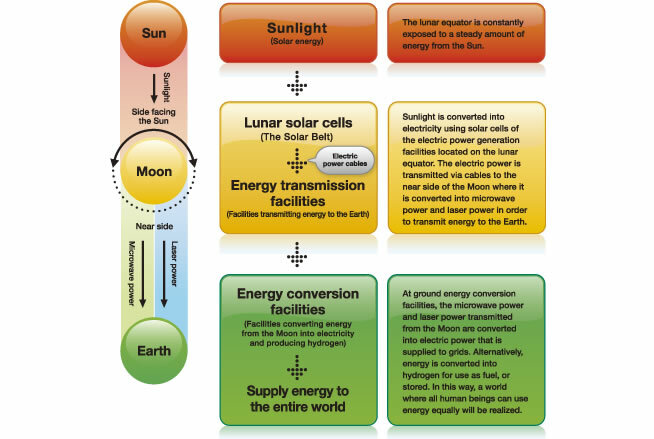 A solar belt around the Moon would theoretically provide more than enough clean energy for all of humanity. You might wonder why we don’t just build solar farms all around the Earth’s Equator instead as surely that would be simpler than trying to do it on the Moon. There are several reasons. The Earth has a thick atmosphere which significantly reduces the amount of the Sun’s energy reaching the surface (luckily for us) whereas the Moon does not. Solar generation on the Moon would thus be vastly more efficient. 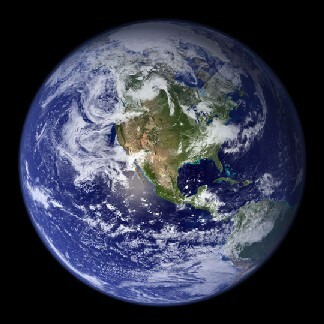 70% of the Earth is covered with water and at the Equator that figure is actually 78.7% water. This makes for a fairly intermittent solar belt. The Equatorial land is largely all in use already. Countries in Central America and South-East Asia are densely populated. The northern African deserts are about the only options. The plan is that most of the infrastructure on the Moon could be built by robots using materials sourced there such as silica to avoid the cost and difficulty of shipping materials from Earth. It’s likely that such an endeavour will not be undertaken in the next 100 years but I applaud the concept and feel that we should always be looking ahead to future solutions even while we work on current solutions with the technology at our disposal. There have already been concepts involving large solar energy collecting satellites that would also beam the energy back to Earth and these could perhaps be implemented in the shorter term. Meanwhile we must persist with finding more terrestrial solutions for clean energy generation. Certainly don’t dismiss any of these ideas as crazy as people from 100 years ago would never have been able to imagine the technology we have today. 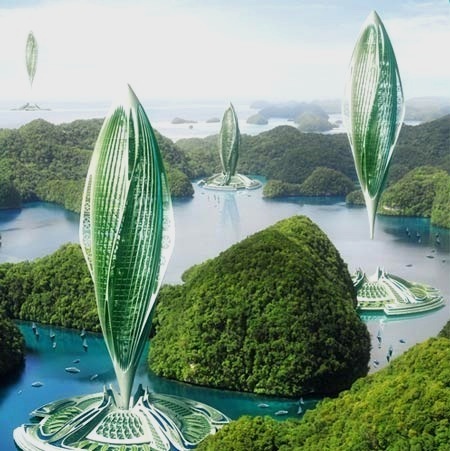 Interesting concept for airship design by Belgian architect Vincent Callebaut called Hydrogenase. Could airships make a comeback? I hope so. In this case the airship is powered by algal-based bio-hydrogen in conjunction with inflatable photovoltaic cells. 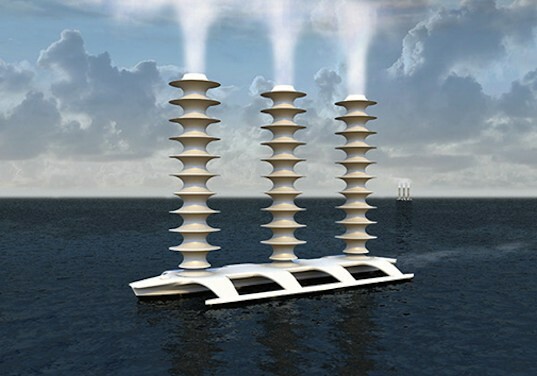 The airship docks with a floating organic seaweed farm that is responsible for the production of the bio-hydrogen. In addition, the dock is covered with solar panels and includes tidal energy turbines as well. But isn’t travelling by airship slow? Well yes, but not as slow as you might think. This concept would be capable of travelling up to 190kph (110mph) and, more importantly, can carry up to 200 tonnes of freight making it more relevant as a replacement for sea freight. And it looks amazing – isn’t that the most important thing? Geoengineering – should we or shouldn’t we? If we, the population of the Earth, accept that climate change is happening, and not in a good way, then it stands to reason we would want to do something about it. The fact that very little is being done about it in a cohesive and collaborative way is a reflection of the fact that there are still many climate change sceptics out there scuttling any attempts to spend the vast sums on new clean infrastructure that we are going to need. The arguments against carbon-trading, capping of CO2 emissions, and reduction of dependence on fossil fuels seem to be never-ending. Most arguments relate to money and the reluctance to spend it on clean technology until man-made climate change is proven beyond all doubt. Unfortunately it is unlikely to ever be proven to their high standards and certainly not before it will be too late to do anything about it. Climatologists talk about a tipping point in the global climate. A point where global temperatures rise high enough that the continual temperature increase becomes self-sustaining. This will happen when enough permafrost in the Arctic melts that methane stored there begins to be released causing further temperature increase and further melting and so on. If we get to that point then I believe it seriously will be too late to do anything about it. Most of the sceptics’ arguments centre around an unwillingness to do anything which will impact on our lives directly, be it travelling less, replacing the car with the bus, replacing the bus with the bicycle, or consuming less energy at home or at work. 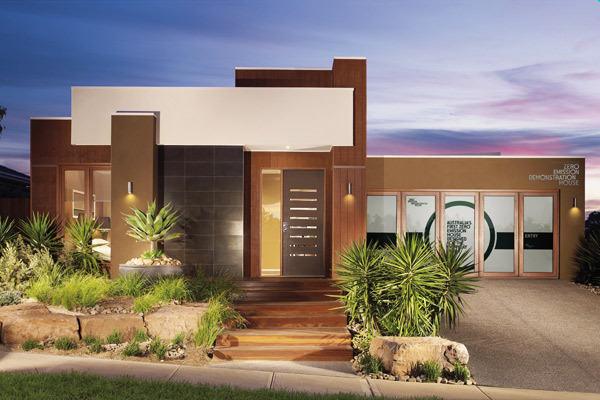 Some of these things such as insulating one’s house receive a boost because they can save you money, but in most cases the payback period is very long creating more reluctance and indecision. And most governments appear unable to put in place consistent incentives which would encourage people to invest in such changes. 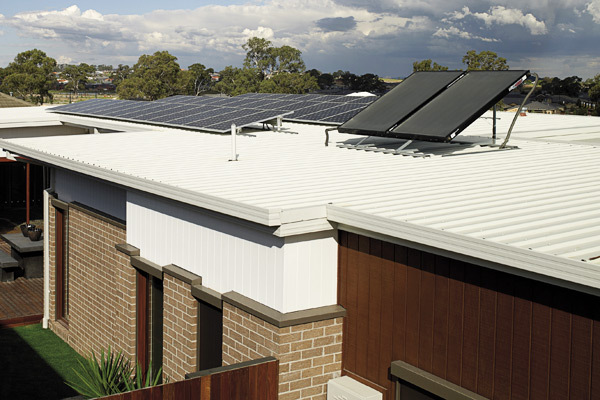 For example, the Australian government was subsidising roof insulation but it was mismanaged and now it is cancelled. They were also subsidising solar panel installation, now they’re not. And there is no certainty or consistency around feed-in tariff legislation either so householders are unwilling to risk investing in solar panels when they can’t accurately predict what it is going to cost them. So if we’re not going to do anything meaningful about reducing our climate change-causing activities, how about trying a new activity which could mitigate the impact of the activities we refuse to curtail? This activity is geoengineering – the concept of “deliberately manipulating the Earth’s climate to counteract the effects of global warming from greenhouse gas emissions” [Wikipedia]. A number of geoengineering concepts have been proposed and discussed and, in most cases, discounted on the basis that they would be too expensive, too uncertain, or simply impossible with our current technology. Examples are; releasing billions of tiny mirrors into the upper atmosphere to reflect the sun’s rays away; releasing dust to mimic the cooling effects of a volcano (probably unlikely given the recent travel disruption in Europe! 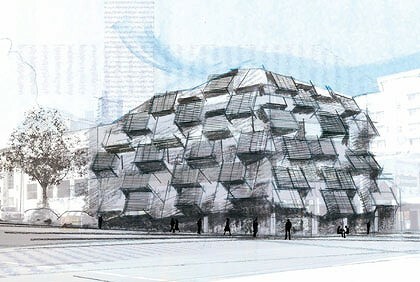 ); or building artificial “trees” that can absorb CO2. Recently another more practical and achievable option has been discussed – cloud seeding. So if one city in the world can afford to waste US$1 billion dollars, how easily could all the countries in the world afford to fund a project together that could very likely guarantee our very existence (or at least make it more difficult for us to wipe ourselves out), for the paltry sum of US$7 billion? The best part is that this concept is scalable. It doesn’t have to all be built and launched at once giving scientists a chance to measure its success on a regional scale before going global. 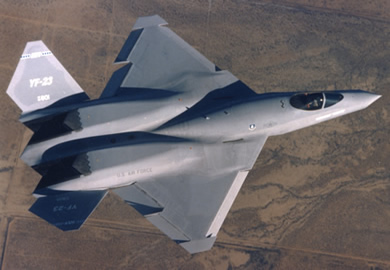 It is estimated that US$25 – 30 million would be enough to set up a test area of 10,000 square kilometres. The research group that are proceeding with this idea are Silver Lining (get it?) and they have had a bounce in the media due to a $300k contribution indirectly from Bill Gates who has provided about $4.5m to investigate climate cooling technologies. Critics of this idea say that we shouldn’t be interfering with the weather or climate in this way as we are not certain what, if any, side-effects there will be. I am of the opinion that through industrialisation and economic growth we have already interfered with the climate and are seeing significant changes in the world’s weather patterns. This project should be considered as an effort to halt or even reverse this damage. In addition, unlike other more ambitious geoengineering projects, these ships can be simply turned off and their effects would vanish within a day or two. So I think there is very little danger of irrevocably damaging the climate. At the very least it is refreshing to hear about a project that offers hope of a solution and actually has some chance of practical application.